A CT (computerised tomography) scan creates detailed images of the inside of your body. It works by taking a series of X-rays, which are processed by a computer to produce images. 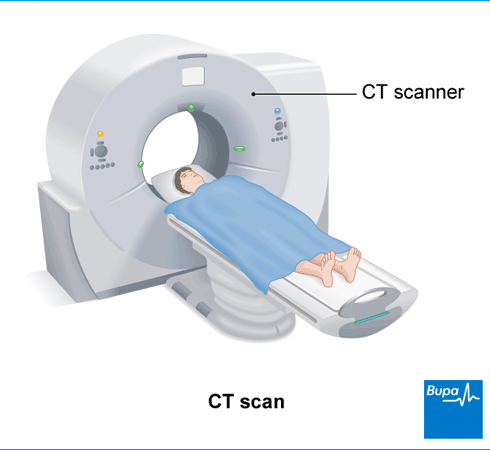 A CT scan can be used to diagnose and monitor a number of different health conditions. A CT scanner is a large, ring-shaped machine with a hole in its centre. You lie on a special table which moves through the middle of the machine. An X-ray tube inside the ring creates a beam of X-rays. As you lie flat on the table, the X-ray tube rotates around your body. The X-rays pass through your body and are picked up by detectors on the opposite side. Signals picked up by the detectors are then collected by a computer and built up into two-dimensional, cross-sectional images of part of your body. CT scans are usually taken across your body (called the axial plane). This is why a CT scan is sometimes referred to as a CAT scan (computed axial tomography scan). Most scanners today take the images continuously, like a spiral, in just a few seconds. Newer CT scanners can also create 3D images. Older CT scans took the images one at a time, stopping after each scan and gradually moving down your body. Different tissues in your body (eg bones and muscles) appear in different shades of grey in the images from the CT scan. Sometimes though, the grey shades are very similar, making it difficult to tell different areas apart. For some types of CT scan, you’ll be asked to take a dye, called a contrast medium to make the images clearer. You may have this by injection, as a liquid that you drink, or occasionally as an enema (inserted into your back passage). The scanner is operated by a radiographer – a health professional trained in performing CT and other scans. You usually have a CT scan as an out-patient in a hospital department (so you won’t need to stay in). CT scans are often preferred to standard X-rays, because they give clearer, more detailed images. They can be used to detect many different health conditions including the following. Strokes – when the blood supply to your brain is cut off. Bone fractures or other problems affecting your bones. Infection, inflammation and other damage inside your body. Conditions affecting your heart and blood vessel. This is called a CT angiography. Digestive problems affecting your stomach and intestines. A CT scan of your colon (large bowel) is sometimes called a virtual colonoscopy. Problems affecting your kidneys, urinary system or bladder. This can be called a CT pyelography or CT urography. Doctors may also use CT scans when planning surgery, or to guide procedures such as biopsies. Depending on the type of scan you’re having, you may be asked not to eat or drink anything for several hours beforehand. If you’re having a CT of your large bowel, you may be given instructions on how to clear your bowel too. This may include taking laxatives before your scan, or following a special diet for a couple of days. It’s important to follow any instructions you’re given before your scan. Wear loose-fitting, comfortable clothes to your CT scan. You may be asked to change into a hospital gown before your scan. This will depend on which part of your body needs to be scanned. There will usually be a private area where you can change. You’ll also be asked to remove any jewellery, glasses, contact lenses, dentures, hair clips and hearing aids. Metal can affect the images created by the scanner. Your radiographer will discuss with you what will happen before, during and after a CT scan. If you’re unsure about anything, don’t be afraid to ask – it’s important that you feel fully informed before going ahead with the scan. You should let your radiographer know if there’s any possibility you might be pregnant. If you’re having a contrast medium, your radiographer will check whether you have any medical conditions, such as asthma, diabetes or kidney disease. These could affect how you react to the dye. An injection of contrast medium can worsen any problems you may have with your kidneys (see Risks section for more information). Your radiographer may ask you to make sure you’ve drunk enough water before your scan to help prevent this. If you’re having a CT scan of your abdomen (tummy), you’ll be asked to drink the contrast medium some time before your scan. You may be asked to drink some water prior to the scan too. You might need to arrive at the hospital a couple of hours before your scan to do this. You’ll be asked to lie on the CT scanner table, usually flat on your back. There may be straps and pillows to help you stay in position and keep still. If you’re having an intravenous contrast, you’ll be given this through a small tube (cannula) into your arm. The injection may make you feel warm for a minute or two, and it can cause a metallic taste in your mouth. You may also feel like you need to pass urine but this wears off quickly. Your radiographer controls the positioning of the table, and will move it into the correct position to start the scan. The table will then move through the machine as the scan is taken. The CT scan itself usually only takes a few minutes. It’s important to lie very still and you may be asked to hold your breath. You may hear some whirring noises from the CT scanner when you’re inside it. Your radiographer will operate the scanner from a control room behind a window. They’ll be able to see, hear and speak to you at all times. A CT scan doesn’t cause any pain, but you might feel a bit uncomfortable from having to stay still for a few minutes. If you’re particularly anxious or nervous, your radiographer may be able to give you a medicine to help you relax during the scan. Once the scan is finished, the CT scanner table will move back out of the scanner ring. The radiographer will come back into the room and lower the table so you can get down. If you’ve had an intravenous (IV) contrast, they will remove the cannula from your arm. You may be asked to stay in the radiology department for 15–30 minutes if you’ve had IV contrast, to make sure you’re not experiencing any side-effects. Otherwise, you’ll be able to go home as soon as you feel ready. Before you go home, ask your radiographer when you can expect to get your results. It can take a week or two for them to come through. Your results will be reviewed by a radiologist (a doctor who specialises in using imaging methods to diagnose medical conditions). Usually, the radiologist will send a report to the doctor who referred you for the CT scan. As with every test, CT scans have some risks. But the benefits of having a CT scan usually outweigh these risks. Your radiographer will explain the risks and benefits to you. A CT scan, like any radiology test, exposes you to some radiation. Radiation can be harmful to your body if you have a high enough dose. The amount of radiation you’ll get from a CT scan is more than that from other types of X-ray imaging, such as a plain X-ray. But it’s still at a level that’s generally considered to be safe. Your doctor and radiographer will take measures to keep your exposure to a minimum. They’ll only recommend a CT scan when there’s a medical benefit, and in some circumstances, they may recommend an alternative test. If you're pregnant, there’s a risk the radiation could harm your unborn baby. How much of a risk there is can depend on how many weeks pregnant you are, and the area of your body being scanned. You may still be advised to have a CT scan if it’s an emergency or your doctor thinks that the benefits of having a scan would outweigh any potential risks. With some CT scans, your radiographer will use a dye (contrast medium). If you’ve had the contrast medium by injection (intravenously), you may have some discomfort as you have the injection. It can make you feel sick or vomit too. Although very rare, it’s possible to have an allergic reaction to the contrast medium. If you get an itchy rash or have any difficulty breathing, tell your radiographer straightaway. Radiology departments are well set up to deal with these reactions. You may be at greater risk of an allergic reaction if you have asthma. If you have kidney disease or diabetes, the contrast can make your condition worse. Your doctor will ask you about any health conditions you have before the scan, so that they can take measures to reduce your risk. What are the alternatives to a CT scan? A CT scan tends to give more complete pictures of your organs and tissues than an ultrasound or X-ray. It’s also quicker, less noisy and less claustrophobic than a magnetic resonance imaging (MRI) scan. But in some circumstances, an X-ray, ultrasound or MRI may be a better option. This depends on your own individual circumstances as well as the reason you’re having the scan. Other types of scan are often preferred for babies and pregnant women.